Beston has been awarded a 2018-19 American Association of University Women or AAUW Fellowship. The AAUW is a nonprofit organization designed to advance gender equity for women and girls through research, education and advocacy. "I was thrilled when I found out about the award. This award is arguably the most meaningful acknowledgement I have received for my work to date," Beston said. "When choosing recipients, the AAUW considers the applicant's scholarly excellence as well as the quality and significance of their research, but also takes into account the applicant's commitment to women in their profession and mentorship activities. "It was really wonderful to be acknowledged not just for my research, but also for my activities as a mentor to other women." Matthew Walsh, associate professor of biology and Beston's faculty adviser, said Beston is highly deserving of the fellowship. "This is a tremendous honor for Shannon, but I'm not surprised she has been awarded this AAUW fellowship," Walsh said. "She is a fantastic researcher and is one of the best graduate students I've had the privilege of working with. Her dissertation work is helping to advance our knowledge of what role ecological factors can play in evolution." The AAUW fellowship isn't the first time Beston has garnered national notice for her work. In spring 2017 she received a Doctoral Dissertation Improvement Grant from the National Science Foundation. 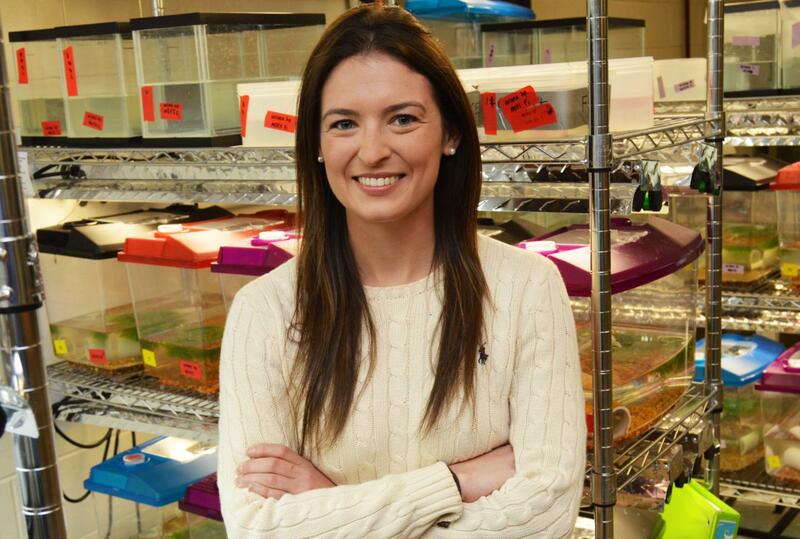 The AAUW award, which is for $20,000, will provide financial support during the final year of her dissertation project, which is titled "The evolution of complexity: tests of the ecological drivers of eye size and brain size evolution in nature." Beston's project focuses on how eyes and brains have evolved in response to predation in populations of killifish, Rivulus hartii, found in streams on the Caribbean island of Trinidad. Much is known about how eye size and brain size vary markedly across species, but little work has addressed how these traits evolve in a single species and what drives the evolution within species variation, she explained. "Trinidadian killifish are found in fish communities on Trinidad that vary in predation intensity, including sites where they are intensely preyed upon by large fish (high predation sites) to sites where they experience no predation (Rivulus-only sites)," she said. "These populations are separated by barrier waterfalls and present a unique opportunity in which we can test how predation can alter the evolution of various traits." Beston's previous work has shown that increased predation is associated with a smaller eye size in killifish and a smaller brain size in male, but not female, killifish. Additional experiments have shown that these differences are genetically based, she said. The remainder of her dissertation has focused on looking at why these patterns are present. "We have performed mark-recapture experiments, where we tracked individual Rivulus and were able to measure survival and growth rate and how that correlates with eye size and brain size," Beston said. "These experiments have yielded some interesting results. It appears that a larger eye size is associated with increased survival, irrespective of predation. However, we also found that Rivulus that are found without predators show a strong positive relationship between growth and eye size. "That is, in sites where there are no predators, Rivulus with a larger eye size grow much faster than those with a smaller eye size. We don't see this relationship in Rivulus from high predation sites. These findings suggest that differences in eye size may actually be the result of competition." The Rivulus found in no-predation sites are found at much greater densities due to the lack of predators, and therefore the competition for food is much more intense. Beston and her colleagues have theorized that larger eye size is advantageous overall, but is especially important in Rivulus-only sites where individuals with a larger eye size may experience fitness-related benefits via foraging. "A larger eye size is correlated with improved vision; thus, those with larger eyes may be better at finding food, which is especially important in Rivulus-only sites, where food is scarce," she said. "Our results also suggest that selection for a larger eye size may be relaxed in high predation sites because competition for food is weak, an indirect effect of predation." Beston and her colleagues have submitted a paper on this topic for publication, and she is now writing up the findings of the mark-recapture work on brain size. For this study, they evaluated the fitness correlates of brain size in nature, and also evaluated underlying behavioral differences, such as learning capability and boldness, and how these correlate to brain size. Beston will return to Trinidad in November to conduct studies using mesocosms, which are experimental water enclosures, in order to begin to understand some of the patterns found in previous mark-recapture experiments. For the 2018-19 academic year, the AAUW awarded a total of $3.9 million through six fellowship and grant programs to 250 scholars, research projects and programs promoting education and equity for women and girls.